The first findings of the latest work and employment relations survey in the UK have been released. They show the number of people working more than 48 hours a week has remained stable since 2004. Meanwhile, the nature of flexible working has changed, becoming more common in some areas and declining in others. The findings suggest managers believe that achieving work–life balance is the responsibility of employees, and few employees feel work interferes with their leisure time. The work and employment relations survey (2011 WERS) is published by the UK government’s Department for Business, Innovation and Skills and is the sixth in a series of studies carried out on work and employment in the UK. It covers wide-ranging issues from collective bargaining coverage to working time and productivity. The first findings (3.51MB PDF) of the survey were published in May 2013. These provide information on the current state of workplace relations and changes since 2004. A further publication, due for release in November 2013, will give a more in-depth analysis of the study’s findings. The study itself gathered data from almost 2,700 managers, 1,000 worker representatives and more than 21,000 employees. It is one of the most important and authoritative sources of information available on British workplaces and employment relations. Long working hours have remained a feature of the British workplace (UK0803049Q). According to recent figures, the UK has the third highest working time in the EU (TN1305017S). The UK has retained an individual opt-out from the maximum 48 hour working week that was mandated by the Working Time Regulations (UK0901039I). In 2011, as in 2004, 11% of employees typically worked more than 48 hours a week. Almost twice as many employees (20%) commonly worked more than 48 hours in workplaces where all employees had opted out of the Working Time Regulations. The survey showed 41% of employees also believed it was necessary to work long hours to progress in their job. This view was more common among professionals (57%) and managers (45%). Longer hours had an impact on employee well-being. 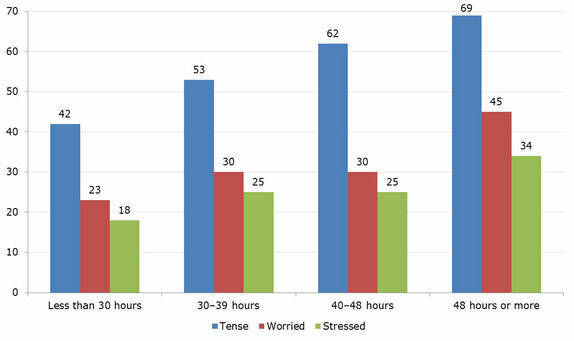 The figure shows that employees working fewer than 30 hours a week were considerably less likely to feel tense, worried or stressed by work than those working more than 48 hours. Note: Responses to whether employees feel tense, worried or uneasy, ‘all’, ‘most’ or ‘some’ of the time. The level of provision of flexible working practices has remained stable since 2004. However, the types of work for which flexible working is likely to be offered and used have changed. Since the 2004 survey, there has been an increase in practices such as home working, compressed hours and term-time-only working. At the same time, the proportion of workplaces offering job-sharing opportunities and reductions in working hours has decreased. The vast majority of workplaces (84%) that had implemented flexible working arrangements had made them available to all employees, and not purely to those with a statutory right to request flexible working, such as workers who have caring responsibilities for adults or children. The most common types of flexible working were flexitime (30%), working from home (17%) and taking paid leave to care for a dependent in an emergency (17%). Managers were asked to identify constraints on providing flexible work arrangements. Just over half (53%) said the nature of the work made flexible working difficult, while almost one-third (30%) said pressure on co-workers was problematic. The cost of flexible working was only a problem for a small minority of managers (9%). In total, 27% of managers reported that there were no constraints at all and those in small private sector enterprises were most likely to have this view (31%). Managers in the public sector were least likely to believe that there were no constraints on provision of flexible working practices (20%). An important finding from WERS is that there appears to be an increased belief among managers that work-life balance is the responsibility of employees. In 2004, 56% of managers believed that it was up to individuals to manage their work and family commitments. This had increased to 71% in 2011. This attitude was more common in the private sector (77%) than in the public sector (69%). Just under half of employees either disagreed or strongly disagreed that they found it difficult to fulfil commitments outside work because of time spent at work, with only 27% agreeing or strongly agreeing. Agreement was more prevalent among full-time employees (31%), and employees with caring responsibilities (30%). Home workers (34%) were also more likely than other types of employees (26%) to say that work interfered with their personal commitments.